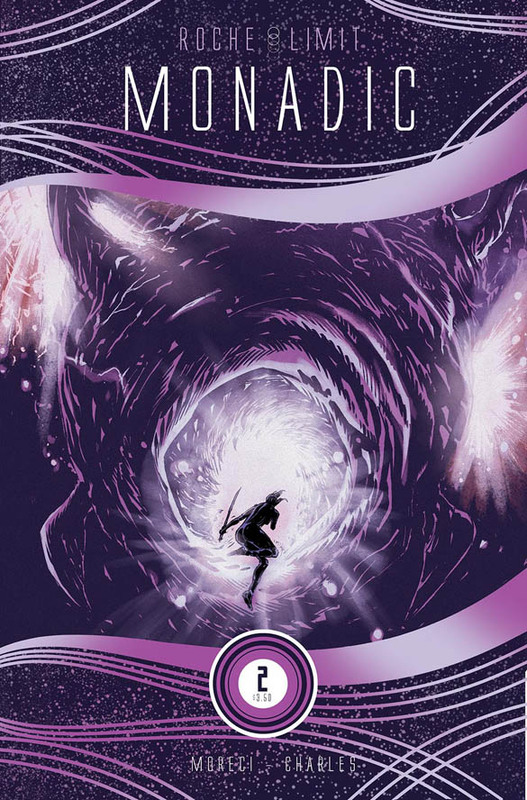 Roche Limit: Monadic #2 is a dizzying adrenaline rush full of mystery and suspense. Michael Moreci isn't offering the information easily so you and the characters are both in the dark. It's a gripping read even though you don't know what the hell is going on or exactly why. He's got us in the palm of his hand because we want to know, we want the characters to know, so we jump on this speeding freight train and hold on. You should too so we can discover what this false reality is all about. Moreci expertly balances the different storylines with ease. Alex is relentlessly searching for the Black Tower, Sasha embarks on a voyage over uncharted waters and a familiar threat reemerges. It’s designed to be mired in mystery, allowing us to awake to the true nature of this world along with the characters. The homage to Blade Runner and The Matrix is undeniable but has an energy and urgency all its own. For new readers, it may take a few pages to fall into Moreci's rhythm as his style is frenetic, distilling exposition on the run, literally. The action is ramped up ten-fold from the first issue and Kyle Charles evokes a frantic style with his lines, it's sketchy and "dirty" befitting the dark urban landscape. The art is deliberately more chaotic than the last chapter in Roche Limit: Clandestiny. Matt Battaglia triumphantly returns as the colorist. Moreci may provide the direction, Charles the foundation but it's Battaglia that injects emotion in each panel. The serenity of a placid body of water next to the shore washed in subtle earth tones, a dark apartment dimly lit in browns and yellows, and a pulse-pounding chase that ends in a blast of fuchsia underlines the tone of each scene. Roche Limit: Monadic is not offering easy answers, at least not yet, and you have to endure like the characters while it plays out before you. Moreci is a master manipulator, moving his chess pieces in place before he reveals more. It's a cerebral cat-and-mouse game that will ultimately pay off in spades. Charles and Battaglia once again provide the fertile groundwork in building this reality working in unison with Moreci. If you're looking for a smart sci-fi thriller Roche Limit: Monadic is the one to get.